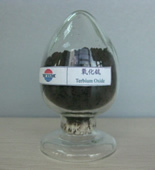 Terbium, atomic no. : 65, symbol as Tb, weight at 158.93, is primarily used in phosphors, particularly in fluorescent lamps and as the high intensity green emitter used in projection televisions, such as the yttrium-aluminum-garnet (Tb:YAG) variety. Terbium responds efficiently to x-ray excitation and is, therefore, used as an x-ray phosphor. Terbium alloys are also used in magneto-optic recording films, such as TbFeCo.